We’ve all fallen victim to common mistakes before. Whether it’s minor traffic errors (yes, left turners always yield) or any of the following gasket installation blunders, they happen to the best of us. If you don’t check your parts over before you begin, you fail before you even begin the actual installation process. One thing you should always check for is warpage in the casting. If the casting has excessive warpage, it will not work no matter how hard you try to make it. If you’re installing gaskets on the cylinder block, you also need to check the deck surface for damage caused by 3M type scrubby pads commonly used for cleaning the deck surface. Surprisingly, one of the biggest gasket installation mistakes is not having the right gasket. When you’re buying gaskets, make sure to check the part numbers to make sure you’re getting the right one. If you don’t have the part number off your old gasket, you can always call us with your engine serial number, and we can look it up for you! Prep, prep, and more prep! Before installation, you have to make sure all surfaces have been properly cleaned. Make sure that the bolt threads and bolt hole threads are not dirty or galled, so that the bolts can be properly tightened. Also be sure to remove any coolant or oil from blind bolt hole. If this isn’t done, you won’t get the correct torque and risk cracking the block. In general, one mistake that commonly occurs is incorrect finish. 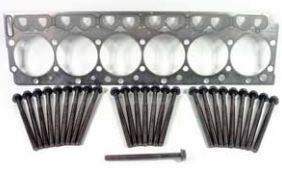 More specific examples are if the cylinder head surface finish isn’t compatible with the head gasket being installed, or if the block surface isn’t compatible with the gaskets being installed. Another pretty common mistake is not placing gaskets correctly. For instance, directional gaskets need to be installed in the right direction, or they won’t seal properly. Also be sure that gaskets stay aligned properly. Missing dowel or locating pins can lead to gaskets becoming misaligned. Yes, this article is about gaskets, but the way bolts and fasteners are installed directly affects how gaskets are installed. When installing bolts, be sure you following the proper tightening sequence and values, and check the bolt installed length against the cylinder head thickness. If you are using torque to yield fasteners, note that they need to be replaced after every use. Torque to angle fasteners do not necessarily need be replaced after every use, so you should check the free length against factory specifications and look for thread stretching to make sure they are still in good condition. Given that placement is so important, it’s easy to see how a technician could improperly use sealant or adhesives when they really shouldn’t. However important placement is though, never use sealers (or lubricants, for that matter) when you should not do so. For example, never use sealers or lubricants to install rubber gaskets, and only use adhesives where applicable. On the flip side, be sure to use sealer on bolt threads that do require sealer. Also lubricate threads (using clean motor oil) where it is recommended to do so. If in doubt, consult the OEM’s manual or ask your parts supplier. Finally, make sure you have the proper clamping load. It should not be high or low, and should always be even. Incorrect clamping loads can be caused by other mistakes mentioned above, such as dirty bolt holes, so that’s why it’s important to check everything over. Highway and Heavy Parts has staff with the right parts and the technical knowledge to help you avoid common mistakes like these. 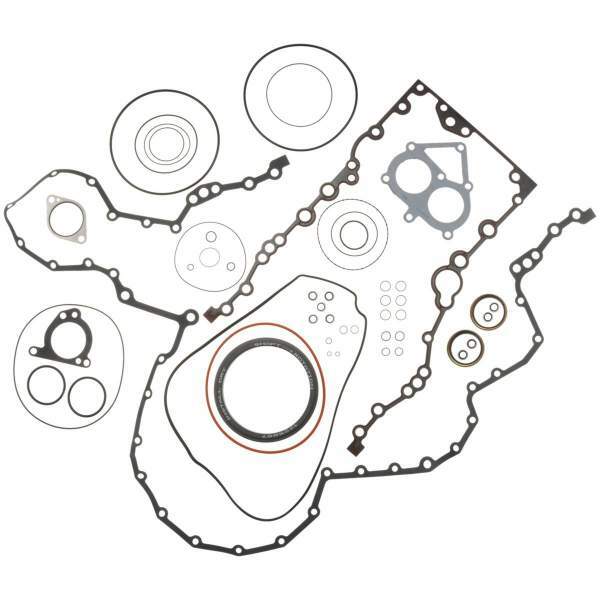 If you have questions about gaskets or gasket installation, give us a call at 844-215-3406 or request a quote online.